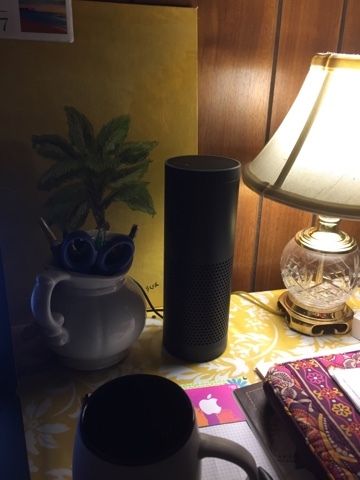 Alexa (Echo), my new buddy, arrived in the mail yesterday. I was really excited earlier in the week to discover that it wasn't the 25th nor the 30th, but the 19th when it would arrive. Thank you Amazon! So...I came home, changed clothes, my bartender, George, poured me a glass of red Zinfandel, and he said "Bye"...knowing he'd not be hearing a peep from me for a while as I get all engrossed. Much as I figured, when it comes out of the package, it had instructions easy to find and easy to follow. First step, plug her in. Next step you get on your phone or tablet and go to a website on amazon. It leads you through set up there, by connecting you to the Echo signal on your wifi list. Once Echo connected, you go and select your wifi at home and the Echo connects to it. Much like any other device, you have to add your wifi security code. As you go through all this it also gives you a tutorial of what all she can do and what to expect and what the buttons and lights mean - which there are not many of either. So it's a seemingly simple device. The app has a number of segments to it. It has several sections to it. Settings, Now Playing, Music and Books, Shopping and To Do Lists, Timers and Alarms, Skills, Smart Home, Things to Try, Help and Feedback. So I went through all those things and set some preferences. The to do list and the grocery list was just already there in the app. So when you tell her to put something on the list, it's there! I love that. So I tested her out and you can ask her what's on your list and she will tell you. This is going to be nice, b/c as I'm cleaning house I can step in the room and tell her things I need to remember w/o even grabbing a pen and writing it down. Of course she can give you the weather and is set to give you a run down of the news on NPR, but you can go into the app and pick CNN which I'm sure Trump would pick right? lol lol lol Wrong! Or Fox News, and BBC. You include the sports news on there - but this is MY amazon. I did tell it that Preds (hockey) and Titans were my teams, but I need to go back in there and add the Packers. So the app was very friendly and it provided suggestions. And it has numerous other apps much like "apps within an app" that you can tell to "enable". For example, there is a thunderstorm app, and I can tell her to play a thunderstorm and she will. There is a rain app, and a good housekeeping app. So I went through and enabled each of the apps I was interested in. In some of the apps you have to tell her to open the app first before the app will work. For example, there is one where she will flip a coin for you. George and I will use this one a lot! lol The app tells you what is best to say and so with this app it said "Alexa, open flip coin". She will open flip coin and she will say "here's your flip": Tails (or Heads). She will play music w/o even having to set anything up. I checked on Spotify and you do have to have premium but it set up to my Pandora with no problem. I just need to go and work on my Pandora list on line to refine my music list there. But she will play music for me w/o even having her play Pandora. One of the surprises was that she will READ my Kindle books aloud to me so it turns into an audio. I'm not sure you can do that with the Kindle alone. I'll have to check into that to see if my books can turn audio in the car (of course Alexa won't be in the car, but I mean, it's making me wonder if I can bluetooth it in somehow through my car.) But I was impressed with that. So I may use that at home some. That would be different for me though. But I like it, b/c I can listen while I iron! Wow, so I can see this being a very useful tool for a blind person. Except that someone would definitely have to set up the app for them initially. But they could tell Alexa "resume reading" and it will. So I had fun with this last night. George not so much. She pretty much heard what he said but he asked weird questions. Like "what is ganghum style?" "What's the gestation period of an armidillo" "What's the best mustard in the world?" "Who's gonna win the super bowl?" "What's the difference b/w a shrimp and a prawn". lol She didn't accomodate him very well but "couldn't understand the question". I thought she couldn't hear him b/c of the music or TV as he asked across the room but she understood him perfectly when I looked back at the history list. I think you have to say Wikipedia, shrimp and prawn. Or something like that. She will tell you she does not search Google if you tell her to google something! So I'm enjoying this for my needs. As this type of technology gets smarter, this is only going to get better. I love asking her the weather. I can't wait to see what all she will do for us in the coming months. You can even ask her "Alexa, What's New?" The Amazon Alexa app has a portal in it which is similar to the App Store on an iphone. When I hit "skills" within the app, it takes me to what reminds me of the app store and you can set up various apps. It gives you what is trending, what is recommended for you, the customer favorites, and it has it broken down by topic - such as "zen and relax", Top Enabled skills, Food and Drink, Games and Trivia, Flash Briefing (your news), Smart Home, Music and Audi, Education and Reference (might have to set that up for George), Money matters, and a whole list of other categories. So yeah, gonna have fun with this. I'm sooooo glad it's Friday. I want to take Alexa to work with me. lol But I'll leave her here with the dogs. I wonder if we can program her to say hello to the dogs mid afternoon "HI Roger, Hi Tugie, Momma and Daddy coming home soon". lol lol lol Probably not yet. Well, I need to get off of here and get ready to go to work. So. Off we go. Have a great day! I hope you enjoy that new toy. I can see little being done this weekend as you finish setting up your Alexa. There seems no end to all she can do. What fun ! Hope you have a fantastic Friday! Alexa sounds great. I have dropped a few hints I would like one. I hope I get one for my Birthday. Can you call Alexa at home from your cellphone? And will she do something that way? INTERESTING device.